The restaurant patio was quieter than the library. There was one woman sitting outside, with a dog lying by her feet. Sue and I walked into the bar at Cosmo’s in Orange Beach and quickly realized we were the only patrons inside. It was 3:30 on the first good beach day in about a week and we were greeted by several staffers. They set tables and did other chores in advance of the maddening red-skinned, owl-eyed tourist hordes that would descend in a few hours seeking liquids and a late dinner. I had just gotten the news that a former staff member died. Jill was only 35 when “Her heart stopped.” I was shocked by it, and yet I really didn’t know her, outside the library. Except for the time that she almost ran me over in her black SUV shortcutting through the Greer’s parking lot. It turns out Jill had problems, like the rest of us, though hers in hindsight were a bit more serious. When we got to the bar, I was feeling thirsty after a few hours on the beach, and yes, a bit confused and saddened by the news of her death. Grabbing chairs in the middle of the bar, we sat down and Sue ordered a Pensacola Bay Raspberry, and I ordered a NOLA Hopitoulas. We had great service, two bartenders. “Cassandra,” in dark-framed glasses, was getting stocked up on new work shirts. She was also gearing up for her shift and put on this accoutrement for opening bottles. She attached two bottle openers to her body where a wrestler would rake an opponent with forearm shivers. We noticed all the stickers about dogs around the bar and both women told us Cosmo’s and the owners’ other restaurant Cobalt are the names of their dogs. “I’ve got a sticker that you’d love,” I said, in between fried shrimp sushi bites. “Yeah, what is it,” Cassandra asked. 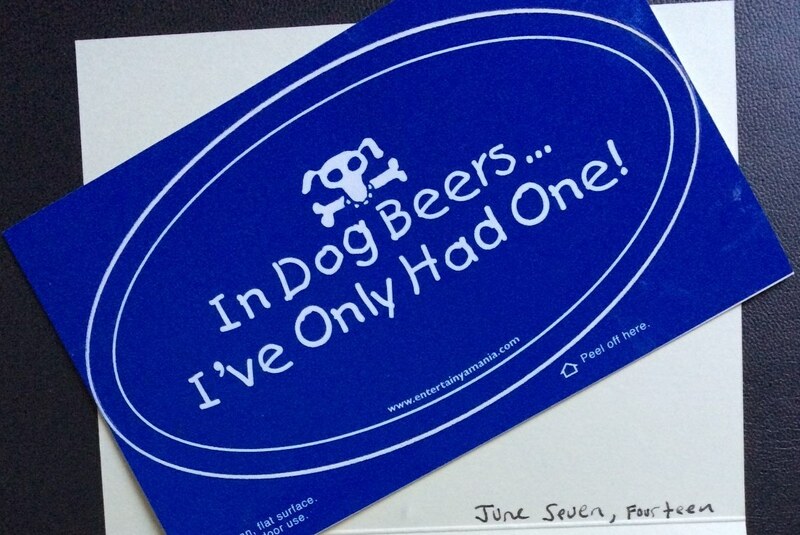 ‘In dog beers, I’ve only had one!’ She laughed, not a patronizing laugh either. I like to believe it was a genuine, never heard it before guffaw. Cassandra asked how our sushi was and talked about how she was going to learn to roll sushi, by her coworker at Cosmo’s. “Are you going to get together at work sometime?” I asked. “No, I’ll just have it at my place,” she said. “A rolling party,” she corrected me, and we laughed at the unspoken marijuana reference wafting through the bar. After some more good conversation and barroom banter we parted ways. I kept thinking about the sticker on the ride home, and I decided to send it to Cassandra. It was only today, writing this card to our barkeeper, that I realized the bartenders and reference desk jockeys have a few things in common. I also sit or stand behind a bar and greet patrons. Librarians are servers too, but of books, information, and computer assistance. Good service, not textbook, but professional, the kind where you form a brief but satisfying relationship, is our aim. Cassandra’s job is not much different than mine at the reference bar at the Fairhope Library. Some similarities and differences are capitalism, ID for legal drinking age, and food safety. The library is not in it to make money, your library card is your ID to get free stuff and to use the computers, and we allow you a safe place to surf the web, check Facebook, or write your resume. Patrons come to us when they want to tell a story, a joke, or are simply lonely or looking for answers. Conversation seems to be the most important thing patrons crave. If nothing else, bartenders and reference staff should be good listeners. Sometimes it’s easier being friends with strangers. Telling the problem to someone often lifts a measure of the burden and remember, when you find a good relationship, work at it, don’t take it for granted. 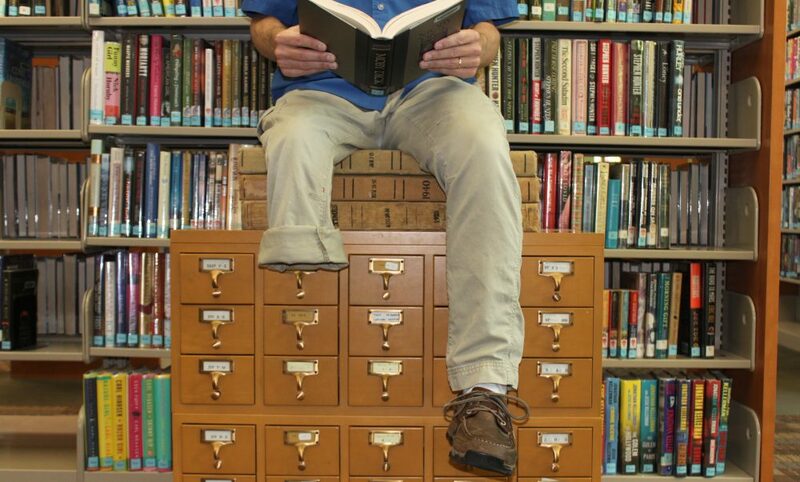 My co-worker Jessica reminded me yesterday about Forrest Little, a former Fairhope Library guy, who died on Father’s Day weekend in 2013. Why, in less than a year, have the following people died? Theresa Barrows. Roberta Long. Tinley Combs. Forrest Little. AJ Crochet. Michael Mannion. Jill. I’ve been the memory tender for some of them here on these pages. I write the stories for the living, so we can read, and remember, but the tenders of bars will never have all the answers. We don’t always know. Sometimes we can only listen.